if you need you can exclude some articles from the module output. Author - the module will search for other articles of the same author or author alias. Not specified - no relation type is selected, so the module won’t search for related articles. However, other module settings will still be valid, e.g. you can display popular articles from the current category. Current Category - the module will automatically search for related articles only in the category the article is located in. This is an extremely useful option that can save your time and efforts when your task is to display related articles from current categories and there are lots of categories. This option will help you to avoid boring work to configure an individual module copy for each category. With RAXO Related Articles (or RAXO Related K2 Items) module you just configure one module copy and publish it in e.g. 50 categories. And the module will automatically defines the current category and shows articles only from the current category. Selected Categories - after pressing this button you can select one or several categories, and the next parameter will help you manage flexibly what to do with these selected categories. Category Filter: Include - the module will search for related articles within the selected categories only. 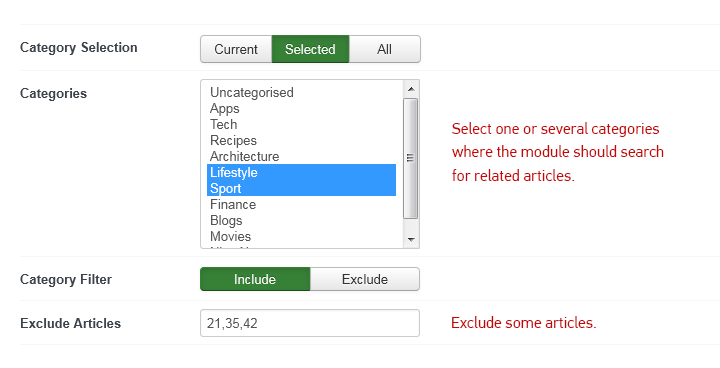 Category Filter: Exclude - the module will search for related articles in all categories, excluding the selected ones. All Categories - for your convenience we made selection of all categories a separate button. Exclude Articles - here you can exclude specific articles from the module output by inserting Article IDs separated by comma. In this section you decide how the module will process (filtrate, order) the content selected. Set how many articles to display in the module block. The modules have lots of date filters to allow you easily and flexibly display articles from a specific date or date range. this year - retrieves articles only of the current year. end date - the module retrieves items dated before the specified date. You can set both start and end dates, or you can specify only one of these dates (either start date or end date), and the module will filtrate and display articles accordingly. With this filter you are able to set a certain time period which is not based on fixed calendar dates but is tied to the current date. Since the current date moves forward with every calendar day, relative date range changes the same way. to X days ago - set the end day of the range relative to the current day. It is not necessary to set both dates. When you specify only one of them, the module is still able to do the job. This filter will be useful when for some reason you need to show only marked news and omit the others. Hide - exclude featured articles from the module display. 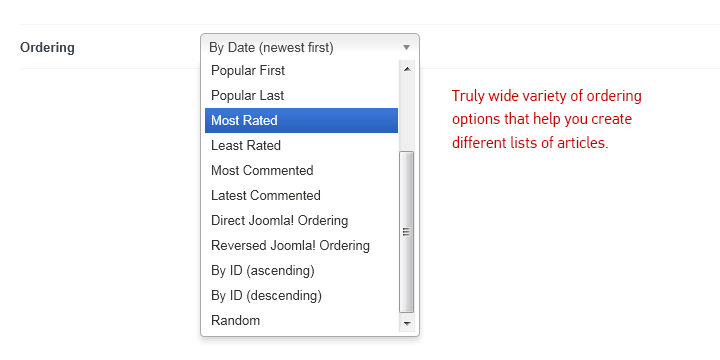 If you select Only featured items show and Joomla Direct/Reverse Ordering (in Ordering options), the module will show only featured items in the same ordering as in Joomla featured articles manager. RAXO Related Articles and RAXO Related K2 items have lots of ordering options (up to 15 variants) so it’s really easy and fast to display articles in the order you want. Ascending order by ID - the articles are listed by article ID from the lowest value to the highest value. Descending order by ID - the articles are listed by article ID from the highest value to the lowest value. Random - the articles are listed in the random order. Our clients find layout support a remarkable module feature. RAXO Related Articles and RAXO Related K2 Items modules are packed with four beautiful and fully responsive built-in module layouts which you can use right out of the box. These layouts immediately add professionally designed look to your site pages. Besides, you can use these layouts as a base or as an example for creating your own module layouts to fit your specific site needs. There can be as many layouts as you wish, and the only limit is your imagination. Here you select the module layout from the drop-down list. Right after the module purchase there will be four layouts (link to built-in) available. Also, you can add to the list your own module layouts or some of ready-to-use additional layouts offered on our site. Here you insert one or several classes separated by comma that will be added to CSS class of the module. This allows for individual module styling. This option can be applied for a range of tasks. E.g. we widely use that to switch between the templates color schemes. Show or hide article titles in the module output. You can cut long titles to make them of the same length. Set the number of characters to enable this function or leave blank if you don’t need it. This smart limitation function doesn’t cut words no matter what number of characters you set. Show or hide article intro text in the module output. Set the number of characters to enable this function or leave blank if you don’t need it. This smart limitation function doesn’t cut words no matter what number of characters you set. Write your version of read more text (e.g. “see full story”, “more details”) to enable read more link or leave blank if you don’t want to show read more links in the module block. In this section you select which content elements you want to display in the module output. Show or hide the article date. Show or hide the category name the article belongs to. Show or hide the author name or author alias of the article. Show or hide the rating of the article. Show or hide the number of hits for the article. Show or hide the number of comments of the article. Press “Show” button to enable images in the module output. Press “Hide” button to display module block without any images. Set thumbnail size in px. The first field defines thumbnail width, the second field defines thumbnail height. You can set both width and height and the module will reduce or enlarge the image accordingly. You can set only one side - either width or height - and the module will calculate the other side automatically preserving the image ratio. If you set to display images and don't specify thumbnail width and height, the module will show original images as they are in your articles. Enable or disable crop image function for creating thumbnails. This parameter works only if both width and height are set. If you disable “Crop Image” option but set thumbnail width and height, the module will fit thumbnails into these dimensions. Here you can write any title for the whole module block. Leave blank if you don’t need this option. Insert a link for the block name. Often this link goes to some related category, but you are free to use any link. You can copy a link from your site menu. Write your own version of read more text for the whole module block. Leave blank if you don’t need this option. Insert a link for “Show all” text, you can use link to the related category or to any other page you want. The number of items to skip in the module. You can use this option to avoid appearing the same articles in module blocks e.g. when you use two module instances with identical settings on one page. This function cleans your text from HTML tags. If you use text limitation we strongly recommend you enable this function. This function preserves some formatting by inserting allowed tags into the field, e.g. “a strong” to preserve links and bold text in the module output. Enable or disable the link to the category name in the module output. The module is used worldwide, and date formats used in different countries may differ. You can adjust the date view in the module output according to international or your country specific formats. s - Seconds, with leading zeros (00 through 59). By default, the module uses article creation date. When you select another date type, the module starts using it for all date related fields, orderings by date, and date filtering. RAXO Related Articles and RAXO Related K2 Items support the most popular commenting systems. To enable comment support you just need to select the commenting system that is used on your site. The module uses images only from Joomla Intro Image field. The module uses images only from Joomla Full Article Image field. The module uses the first image found in article body. This is an awesome option which allows you to display thumbnails no matter where the original image is. Automatic Selection checks all the sources in the order as in the list above, and creates thumbnails from the first image found. If none images are found, the module shows a default image. By enabling this option you make thumbnails in the module clickable and linked to the corresponding article pages. By enabling this option you replace original image title with article title. If your articles don't have any images, you still can make the module output more presentable by showing a default image. For your convenience the module is packed with three default images for different thumbnail sizes. If you don't want to use default image - select "None Selected". There is one more useful way you apply default image option on your site. You can use your own image (e.g. company’s logo or a special category symbol) as a default image. So add your image (allowed types are *.png *.gif or *.jpg) to this folder and use it for your purposes. We’d like to pull your attention to this parameters, because they are important for your site performance. Well-chosen module caching can be speed up your page load time and reduce server load. Here you enable or disable caching of the content displayed in the module. Specify the time (in seconds) for module cache file to be stored before it is refreshed.